The weather is slowly warming up bringing all the springtime fun with it. You can find so much to enjoy near your University City apartment in Charlotte, NC! The entire metro area is bustling with activity, waking up from the long winters nap. 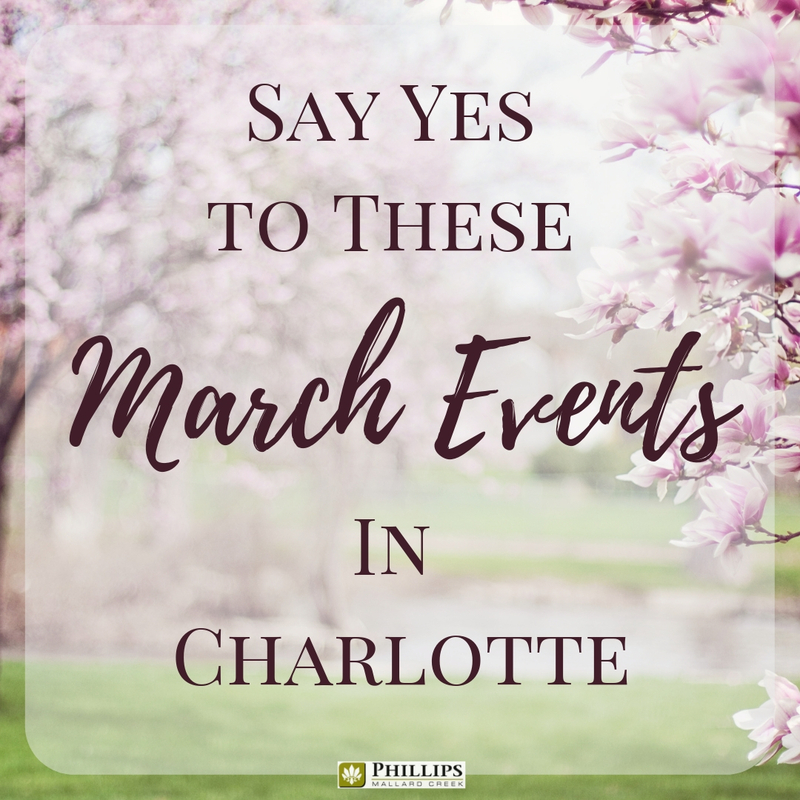 Whether you want to spend a few hours outdoors in the fresh air or partying the night away, the Queen City has more than enough March events to keep you smiling all month long. Phillips Mallard Creek Apartments makes the perfect home base for all things Charlotte, NC! Lenny Boy Brewing is having a fun night of comedy that you are sure to love. The Charlotte Comedy Theater will be on hand for an interactive improv comedy show that will have you rolling on the floor with laughter. Bring your friends that love to laugh and enjoy a pint or two. Remember, things are always funnier after a drink or two. If you are pumped to watch Marvel's first female driven superhero film, then you will want to take your girl power down to Studio Movie Grill in the Epicentre. You can get food and drinks while watching all the evil-defeating action. This is sure to be a fan favorite, so plan ahead if you want the good seats. If you want more improv in March, you can head to the Business Improv Workshop at the Advent Coworking space. The point of this workshop is to help you become a more comfortable speaker during meetings or work presentations. Still an interactive event, but the focus will be slightly different. Your little ones will be pumped if you decide to take them to the Sesame Street Live show at the Bojangles Coliseum. They can dance and sing with Elmo, Big Bird, and the Cookie Monster. This fun interactive event is great for children of all ages, those under two do not need a ticket to gain admission. Head to the U.S. National Whitewater Center and watch them turn the river green! This family-friendly event starts at 9:30 am with an outdoor yoga session and lasts all day long! In addition to the green river, you will also find live music, beer, a trail run, and all the regular whitewater center activities! The historic Latta Plantation is the place to celebrate all things Irish at the Celtic Festival. You will hear plenty of traditional music, be impressed by the Celtic dancers, and find handcrafted goods to buy. There will also be a whiskey garden for sipping. Leave the kiddos back at your University City apartments in Charlotte, NC because there is an Outlander after party that extends into the evening hours! Watch a few inspiring films at the Banff Mountain Film Festival! This selection of award-winning films will be screening in the McGlohon theatre for its sixth consecutive year. The films center around the great outdoors featuring mountain biking, surfing, skiing, and so much more. The beauty of the landscapes is even enough reason to enjoy the films. Do you support the home team in your University City apartments in Charlotte, NC? Well, come out and show your love at the Spectrum Center where the Charlotte Hornets are taking on the Boston Celtics. You can wear your purple and teal with pride. Do you have hidden musical talents that you are ready to show off to the Queen City? The Evening Muse in NoDa is having an Open Mic Night where you can go to shine! The Find Your Muse show starts at 8pm, and the door price is only $3. Even if you don't want to perform yourself, you can still go and be impressed by all the local talent. Leave your University City apartment in Charlotte, NC very hungry because the Soul of the South Uptown Food Tour will be filling your belly. You will get to sample the wares of six local restaurants. Plus, there will be wine and beer pairings to bring out all of the flavors. Your tickets will include all the food and drink samples. There is no denying it, March is going to be an active month! 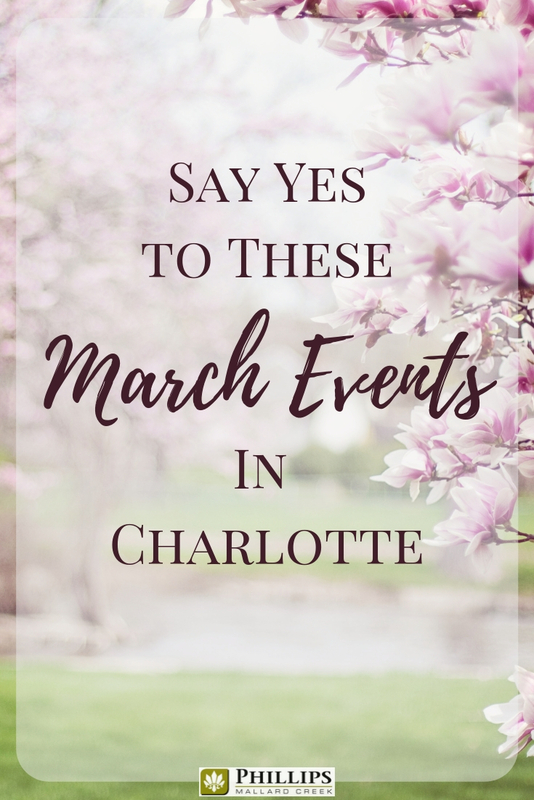 There are so many events to say yes to that you will barely find the time to get your spring cleaning done in your University City apartments in Charlotte, NC. That's okay though, right? Sipping a good beer on a patio is way more fun than dusting baseboards. Get out there and enjoy the Spring!